Q: What do you call a business presentation without a compelling chart? A: A request for early retirement. In the business world, a lot can be riding on a single presentation. So it has to be convincing and carry impact. And when it comes to dishing decisive data, Apple’s iWork suite of applications serve up the most delicious display of digital daring-do. The “Add Chart with Numbers Table Data” action makes it easy to insert creative charts, based on data from Numbers documents, into Keynote presentations. The method for identifying the Numbers table to be used as the source data for the created chart. The type of chart to be created from the source data. Parameters related to identifying the source table data are placed in the top box in the action view. Parameters related to determining the chart type and data display method are placed in the bottom box in the action view. (⬇ see below ) The image to be replaced is set be identified by its file name. 1 Source Document File • Select the document file that contains the table whose data is to be used as the source for the created chart. To open the Numbers document file indicated in the source popup menu, click the adjacent “Open” button. 2 Use Open Document • Instead of specifying a Numbers document using the “Source Document File” fie picker 1 select this checkbox to indicate the action should use the frontmost document open in Numbers when the parent workflow is executed. 4 Table Name • If the “Data Source Menu” 3 is set to “Named table…” this text input will be enabled. Enter the name of the Numbers table to used as the data source. 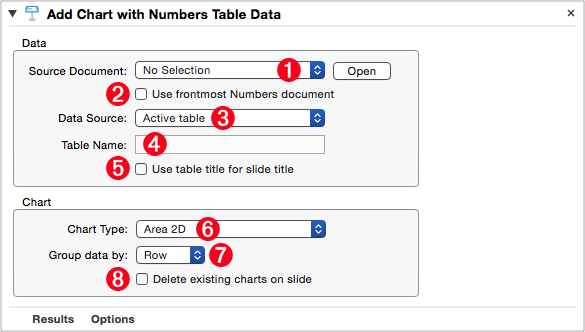 5 Table Name for Slide Title • Select this option to use the table name as the title for the slide that hosts the created chart. 7 Data Grouping • Select the data grouping method to use for the chart. 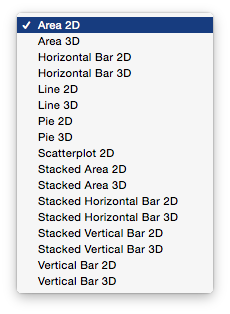 Options include grouping data: by row; or by column. 8 Delete All Charts • Select this option to delete any existing charts on the host slide. A useful option for updating an existing presentation.